Legislators and leaders of the Louisiana Association of Business and Industry (LABI) would do well to pay attention to the rumblings of discontent that began in West Virginia and rolled westward into Kentucky and Oklahoma. Those same rumblings, though faint and indistinct for now, are being picked up by those in tune with the times. 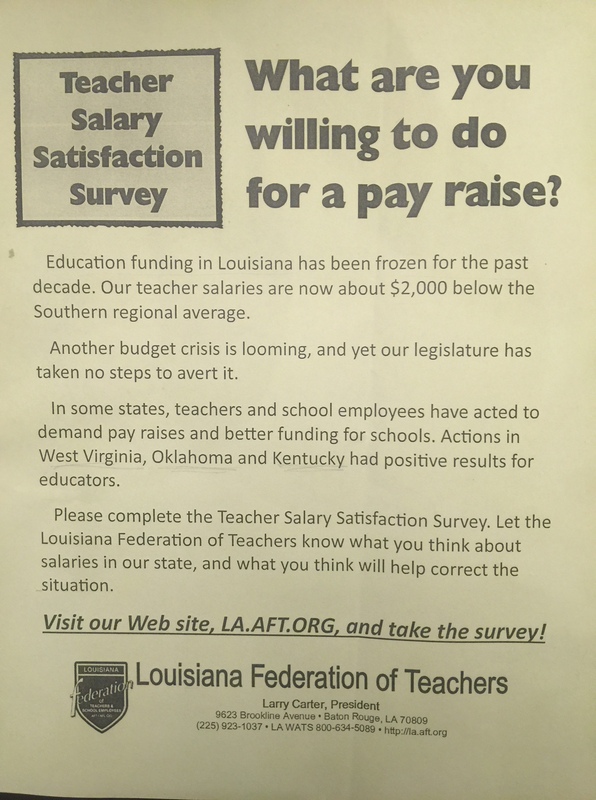 Louisiana’s public school teachers, a group to whom I owe so very much from a personal perspective and to whom I shall ever remain loyal, are quietly receiving copies of a “Teacher Salary Satisfaction Survey” being distributed by the Louisiana Federation of Teachers (LFT). It could just as easily be called a “Teacher Salary Dissatisfaction Survey. How can that possibly be? How could we have allowed ourselves to neglect the most dedicated, the most heroic among us for so very long? We gave state police huge salary increases and while I don’t begrudge their pay increases, they certainly should not have come at the expense of teacher salaries. Teachers should never have to bow down at the sacrificial altar of political servitude, yet that is precisely what has happened. I can still remember that little presidential wannabe Bobby Jindal telling LABI that the only reason some teachers are still in the classroom was by virtue of their being able to breathe. That was just before Sandy Hook when a teacher stood between a gunman and a student and took a bullet that ended her breathing ability but which allowed a child to go on living. I still remember teachers at Ruston High School taking an interest in the well-concealed abilities of a poverty-stricken, less-than-mediocre student and nurturing and cultivating those latent talents into eventual college material and a career in journalism. They didn’t have to do that; they could have let him slip through the cracks. But they didn’t. Thanks, Mrs. Garrett, Miss Lewis, Miss Hinton, Mr. Ryland, Coach Perkins, Mr. Peoples, Mr. Barnes. Thanks so very much. You never knew (or maybe you did) what your compassion meant to that kid. “Another budget crisis is looming, and yet our legislature has taken no steps to avert it,” the flier says. True. So true. The legislature has taken no steps because legislators, for the most part, are in bed with the special interests who are slowly bleeding this state to death with overly-generous tax breaks even as benefits are being ripped from our citizens. Benefits like health care, education, decent roads and bridges, flood control, the environment—benefits that we rely on our elected officials to provide. Oh, but they haven’t forgotten the tax breaks for the Saints, the Pelicans, the Walmarts, the Exxons, the Dow Chemicals, pharmaceuticals, the movie industry, the utilities, the banks and payday loan companies, the nursing homes, the private prisons, the Koch brothers, the Grover Norquists, the American Legislative Exchange Council (ALEC), or chicken-plucking plants. But teachers? Nope. They don’t need raises. Besides, we have virtual academies and charter schools, so who needs public education? LABI, of course, would beg to differ. After all, LABI was created back in the 1970s for the express purpose of destroying labor unions in Louisiana through passage of the right to work law. I got that straight from the mouth of Ed Steimel, one of the moving forces for the creation of LABI, shortly before his death. But let’s back up a minute and pause for reflection before you try to label me as some ranting liberal or even worse, a (gasp) communist. Your annual two-week (or whatever the length of time) vacation? How about the eight-hour work day? The abolition of sweat shops where children as young as seven or eight are required to work 12- or 14-hour days for pennies? Workplace safety reforms that have drastically reduced injuries and deaths at work? Sanitation laws that have cleaned up the meatpacking industry? Well, gee, if you approve of all that, you must be a ranting liberal yourself. Or worse, a (nah, better not say it). But just who do you think brought about those reforms? It certainly wasn’t management. Okay, the guvmint was largely responsible for the meatpacking industry reforms but for the rest, you can tip your hat to organized labor. 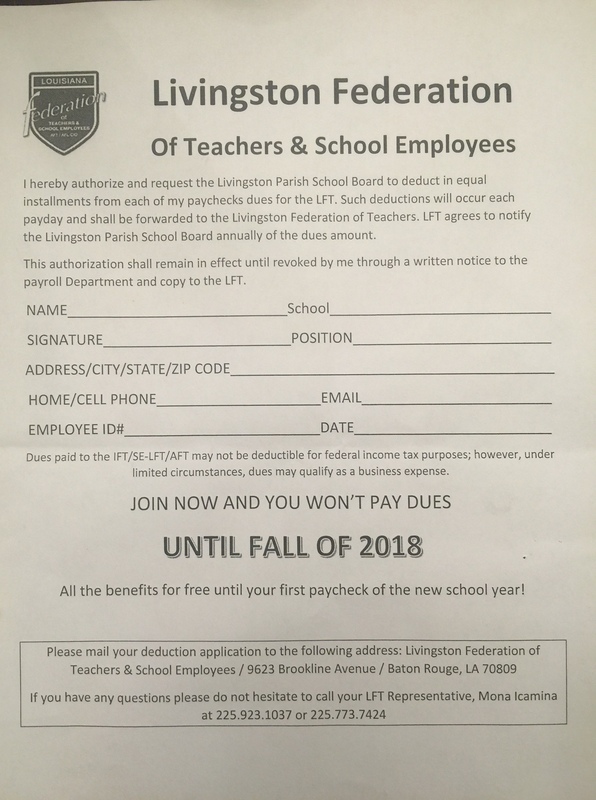 The second page is an authorization form requesting the local school board (in this case, Livingston Parish) to deduct dues for the LFT. Legislators and LABI are being taken to class here and they’d be wise to pay attention lest they get a failing grade.